Super typhoons, Christmas carolers, and the occasional middle finger…. Well, our little slice of heaven successfully rode out super typhoon Hagupit/Ruby, with the only indication of it passing being a small rise in the wind levels on Friday evening, an event that prompted yours truly to rush out and batten everything down. Of course, by the time I was done with my battening, the wind had already died down, so my taste of a super storm was thankfully quite limited. These storms are VERY scary – winds of 320 KpH simply destroy everything in their path and whatever is not smashed to dust is washed away in the irresistible wall of water better known as storm surge. Thank you, Dumaguete, for being nestled away to the west of the country, protectively poised behind Mindanoa, Cebu and Bohol. Phew! I also had to fire up Facebook at 3 AM one morning to remove a somewhat bizarre post some woman named Simone had put up in the Typhoon Hagupit post. Some folks – myself included – had stated that their thoughts and prayers were with those who were going to be affected by the super storm. Simone – who is apparently a rather militant atheist according to her Facebook page – took offense at the prayers and put in an image entitled “Jesus Fu$%ing Christ,” which showed – in intimate detail – just that. I am not an overly religious person, but at that point in the typhoon track, thoughts and prayers were pretty much all one could offer in the face of what could have been an incredibly devastating event. Simone didn’t like that, so she put up the image. Tacky and kinda gross, Simone. But then again, from your page, I guess that’s what you get for being plump and plain, with your only relationship of note being your collection of large dogs. Ugh, now I am lowering myself to your level. Meh, bad timing, Simone…. Here’s me talking to my little box on a stick again…. In other, more pleasant news, the Christmas season is upon us and we are starting to get carolers coming through. I caught one group of local kids singing their hearts out, and in my humble opinion, the little guy and gals did quite a good job. Michell also noted that she used to do it with friends when she was a tyke, and they used to save up the money for Christmas purchases – and candy…. Some people don’t like the carolers – considering them nothing more than opportunistic beggars – and to that I simply say, “Bah humbug!” Sheesh, guys, what’s a few pesos here and there? Just make it a part of your budget…..
Then, the next day I was mowing the lawn and noticed a bunch of kids hanging by our gate, watching the big pink Kano sweat and grumble in the midday heat. I started chatting with the little miscreants and then Michell came out and let the little buzzards in the yard, Yelling and screaming and flying frisbee’s soon ensued as was the opportunity for a group photo in Michell’s tea party corner. Cutest kids in the world. No wonder there’s a population explosion…. I was also supposed to start up open water certification (SCUBA) this morning, but there was a last minute problem with the billing, so I was forced to cancel and sign up with another company. So, tomorrow I will be hopping on my motorcycle and zipping over to Harold’s Mansion’s Mares dive shop. Watch out sharks – here I come!!! Sunrise day before Hagupit – so cool and peaceful…..
great job Ned .. wish you nd chelle the best 2015 .. stay safe .. we love you both .. Thanks, Mae and back atcha!!! I have seen first hand the negative effects that imposing Western rationale onto the local population. In most cases, the Expat is made to look foolish and even laughed at. Some do keep an open mind upon arrival and do come over for the right reasons. A lot of respect will go a long way. The guy flipping the bird gives all a bad name. That two minute snippet of the kids singing brought everything important in perspective. A hundred pesos is not going to hurt any one’s long term budget…even for multiple visitations. Thank goodness you have a woman that brings life in your yard. Now what was more important, perfectly manacured grass or experiencing the wonderful people of the P.I. ? I realize that I am preaching to the choir. Maybe I am just in a state of transference. Hi NED seems ashamed that some people cannot stand the kids Christmas Caroling…Oh it were done more all over the world…may make it a better place….yeah I mist the kids and their caroling…as you said…whats a few pesos…anyway…hows the house hunting coming along…had any luck yet ? ?….MERRY CHRISTMAS to you and Michelle and a better NEWYEAR!! emigrated to Phils 2 weeks ago, looking forward to my first typhoon, end up being in the eye of the biggest one this year, whilst visiting GF relatives in Calbayog, Samar. Be careful what you wish for, say I. Ha ha. All turned out well in the end , had a few extra days in the Ciriaco hotel, the best hotel, no , the only decent hotel in Calbayog. Look forward to catching up with some “carollers” soon, good luck to you both. 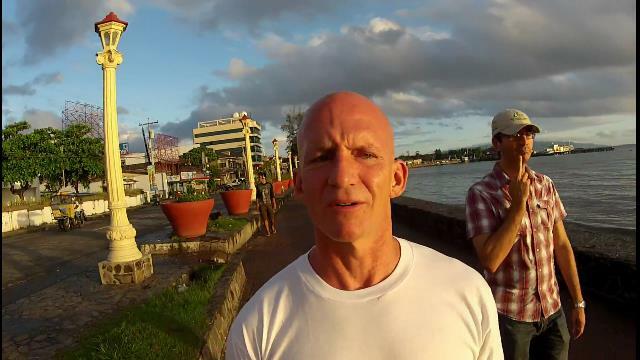 I really enjoyed your ride through Dumaguete, one of your best videos to date. You should do another, the commentary was very informative and made me laugh. Though I never understood the first joke. I enjoyed the carolers. The kids looked cute. As for the cano and the finger. How rude! Bet he felt pleased with himself. Oh well, some people don’t adapt to their surroundings. As for the typhoons, that is just how it is in the Philippines. You get tornadoes in the Mid West, now that scared me more than any typhoon. Never again!